She glides across the polished wood flat track. You can see that absolute concentration has taken over every thought. Her grace isn't broken until she forces her way through the barrier of women trying to hold her back. No one - nothing - stops this power house. She comes through regardless, and she's doing it on wheels. Amanda Misisian, better known by her roller derby alias: Feta Sleeze plays on two teams for Detroit Derby Girls (DDG): jammer on the DDG travel team and jammer and blocker for the Devils Night Dames home team (also a part of the DDG). When you see the way she demolishes a pack, you would think she had been doing it her whole life. Truth is, she's been involved with the DDG for just five years. 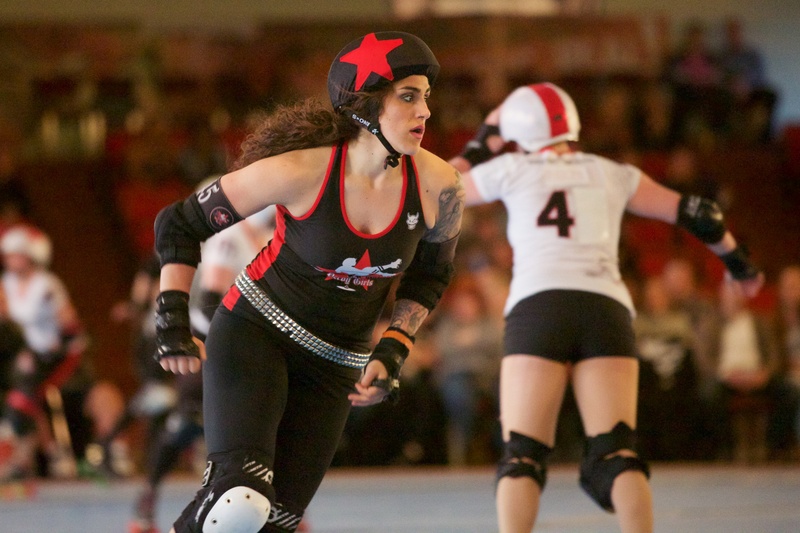 In those five years, she's been named MVP twice, voted "Most Feared" and "Miss Congeniality" at the Rollies Awards and as an alternate for the All-Stars game at Rollercon. Feta is honored and grateful to be a recognized athlete. "I am so appreciative of everything that derby has given me - awards, athleticism, friendship," she says. But Feta Sleeze's derby career hasn't always been straight wins. After placing in the 6th place at the D1 playoffs in Jacksonville, Florida this year, Feta admits to getting "CRUSHED" in their first game against the Jacksonville Roller Girls. The bout ended with a final score of 71-262. But failure doesn't even come close to discouraging her and driving her away from this high intensity sport. Over the years, she has learned that losing is just as much part of the game as winning. Just like any sport, roller derby is a big time committment, especially when committing to more than one league. When Feta Sleeze isn't at derby practice/games or working at her day job as a paralegal, she still likes to stay active. She enjoys dancing, lifting weights, fishing, swimming and spending time with her family and fiancé. And training. Always training to be stronger, better, faster... She keeps fighting. Every athlete of The Detroit Derby Girls shares the same passion as Feta, and I have personally witnessed it at their bouts. No matter what the score is or how they are performing, they always keep fighting which is what strengthens their inclusive community. Their fighting spirit is why we featured them (starring Feta Sleeze) in our latest video "The Pack".